This morning I woke up giddy about random acts of kindness floating in my brain. A coworker was celebrating her 40th birthday and another friend’s miracle baby was turning one. Birthday celebrations ALWAYS bring me joy (even when I’m not a part of the festivities!) I was hoping to do something special today to honor them both. I ADORE businesses that give back like this! And 100% profit? Unheard of. I decided this would be a perfect birthday RAK to not only honor my friends, but bless others as well. My plan was pretty simple: swing by the elementary school after work, buy a box of donuts (maybe 2!) then take them with me to my hair appointment and pass them out. 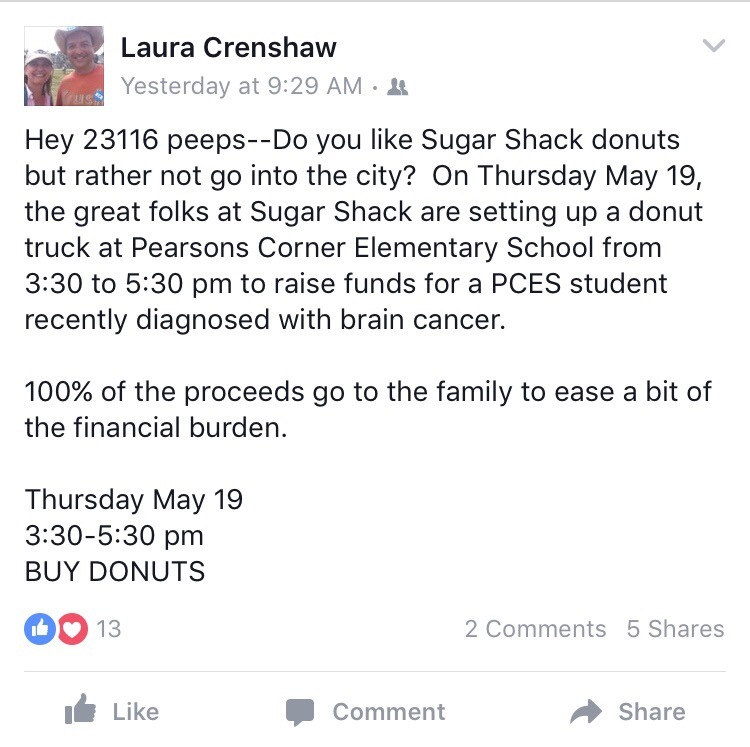 After all, who can resist Sugar Shack donuts? Sometimes best laid plans go awry. I got engrossed in my work and left school later than planned. Arriving at the fundraiser, I saw the line was wrapped around the side of the building with only 30 minutes left in the sale. 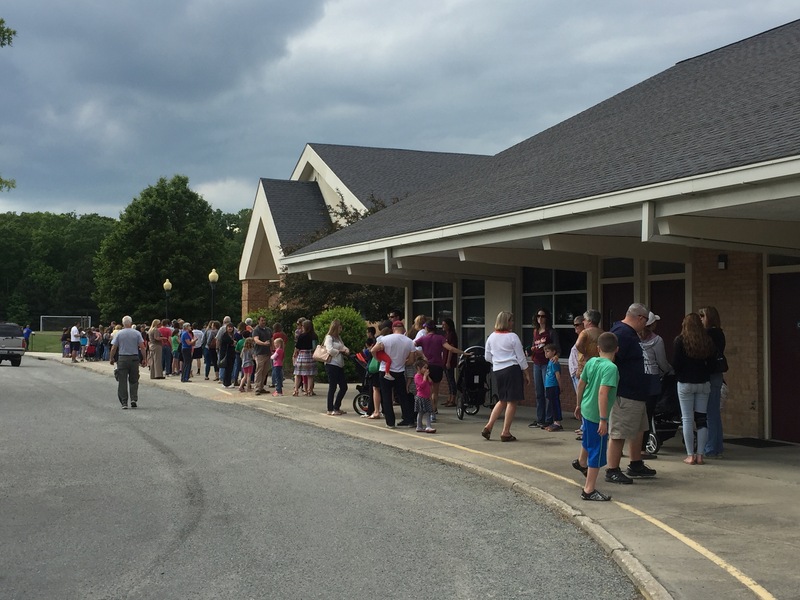 I got in line, determined to wait it out, then saw a school representative heading our way. That was fine. Any kind of Sugar Shack donut would do. Hmmm. That might be an issue. My hair appointment was in 45 minutes and I still needed time to drive there. My brain started practicing probability. What were the chances I would get to the front of the line in 30 minutes? Would they even have 6 donuts left for purchase? Should I wait or should I stay? I reached into my wallet, grabbed a handful of bills and tossed them into the donation bucket near the line. My posture was a little deflated as I walked back to my car empty-handed, but I quickly reminded myself of my purpose. Today is a celebration of two special birthdays. Maybe I could find a different way to honor these sweet gals. 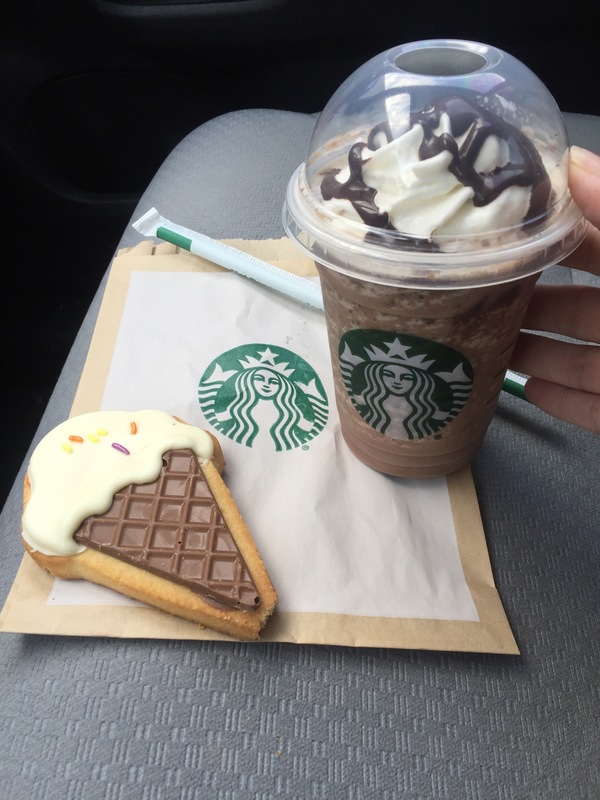 I stopped by Starbucks and decided to surprise my hair stylist, Hayley, with two sweet surprises: a chocolate chip frappuccino and a cute decorated cookie. Arriving at my hair appointment, Hayley was delightfully surprised, but whispered in my ear as we walked back to her station. Oh no. Once again my good intentions were dashed with a detour, this time due to allergies. “Well, you could always find a friend and pay-it-forward,” I offered. Within seconds a voice piped up behind us. “I’m a friend!” We turned to see her co-worker smiling, pointing at the dairy-filled drink. Laughing, Hayley passed the drink along, making the other gal’s smile even brighter. 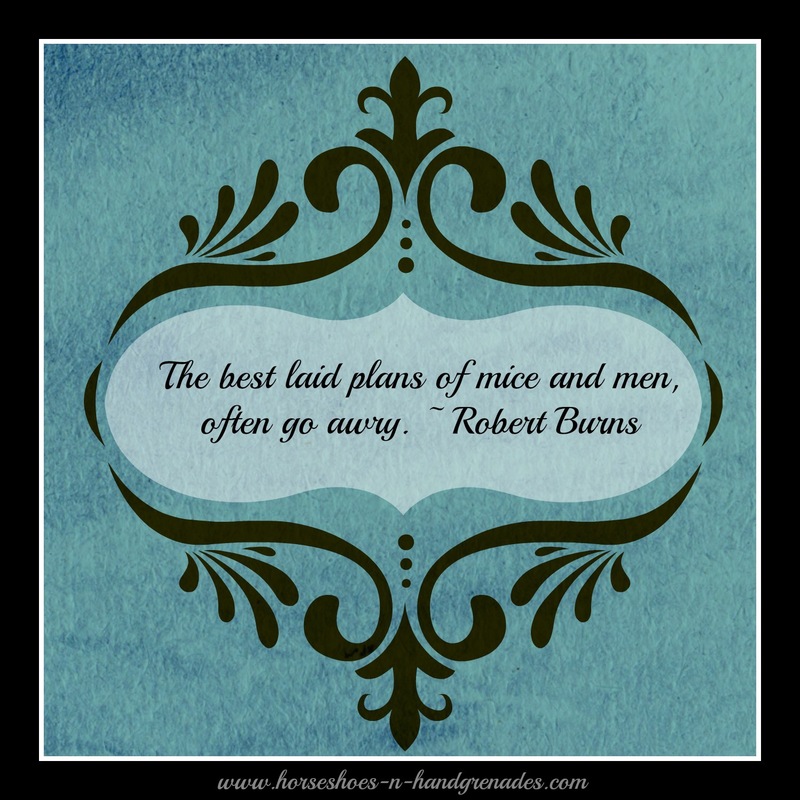 Sometimes our plans simply don’t work out the way we want. Sometimes those plans work out the way they should. It was a positive thing that the Sugar Shack line was so long around the building and they had sold so many donuts. Look at all the money raised to help a well-deserving family! My hair stylist received an unexpected surprise and got to share in the joy of blessing someone else. Another hair stylist enjoyed a cold drink as she worked the late shift this evening. 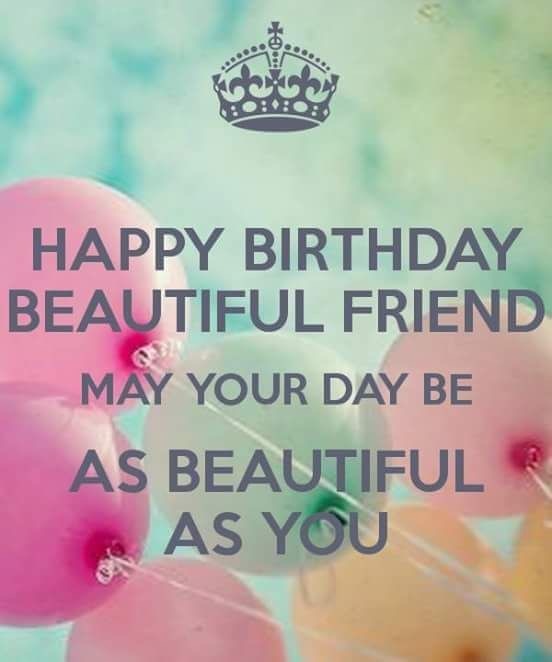 Best of all, my birthday friends were thought of today with love and celebration and others were blessed simply because they were born.